January 27, 2019 – Although the predicted temperature of 28 degrees ended up being only 9 when we got to the Unit, we thought we might give it a try. Finding a place to park was tough, but one of the farms had some bulldozing recently done which created an opening we could pull in to. We treated the puppy’s feet and tried to walk to the nearest fence row, about 3/4 miles from the truck. The snow was crusted over and about 2 feet deep with drifted areas even deeper. I’m sure you know what this is like. 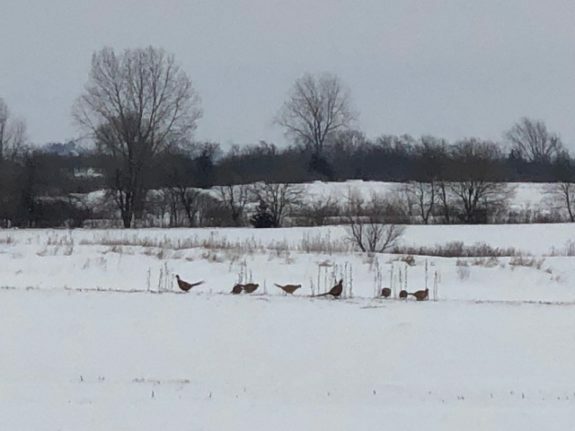 After working hard for about 45 minutes to cross the field, I realized that it was too cold and the conditions too bad for the quail if I broke up a covey, so we turned back and headed out. 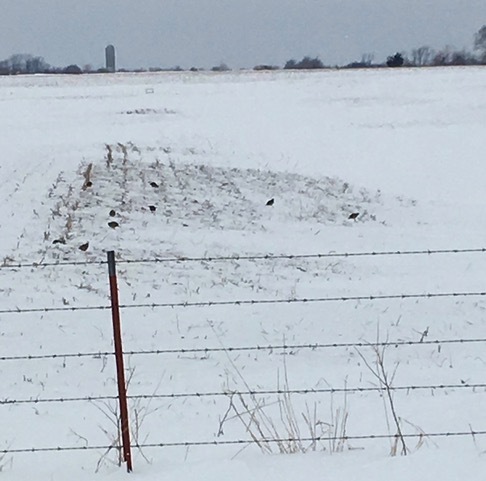 We saw lots of turkeys, deer, pheasants, and quail feeding out in the open spots in harvested fields. The birds were very vulnerable, so I’m glad we did not pursue them on this day. We had a good cardio workout, and the puppy loved it. The quail in this photo were about 200 yards from the nearest cover. Not a good situation for them. I hope they make it through this cold and ice spell, but I fear we’ll lose birds this late winter. The following weekend the temperatures were in the mid to upper 50’s. Thanks Garry for your concern about the survival of the birds rather than the amount of birds you could have put in your bag. Sportsmen such as yourself are the upland bird members we choose to renew and select as new members in the future.